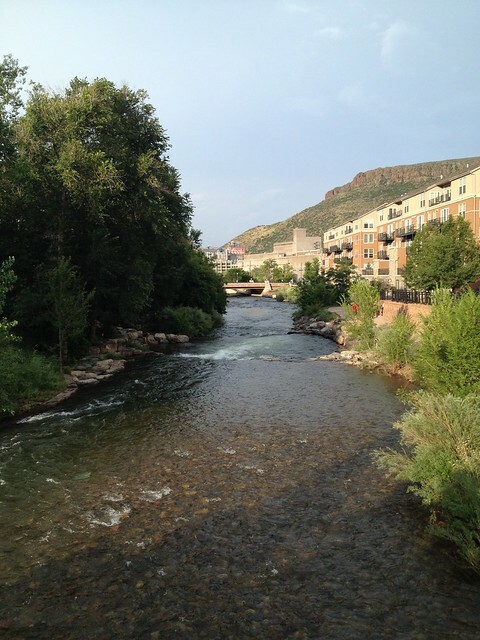 We spent one evening, though not the night, in Golden, Colorado. Reminded me a lot of parts of the Twin Cities. A very hippy vibe for sitting next to the Miller/Coors brewery. We checked out the local fair that was going on so Eryn could slide down the giant bouncy slide, walked along the river where lots of people were tubing despite the rain, and had dinner at Woody's Wood Fired Pizza, which was excellent and had particularly friendly service. I know this photo doesn't look like it's raining, but you can see some of the clouds in the next one. Then again, maybe I just remember rain the whole time despite it not raining the whole time. Everywhere we went was somewhat flooded or raining. In Colorado Springs. In Denver. Near Vail and Breckenridge on the mountain. I noticed in the news it rained more after we left - as in more frequently and with more intensity - the whole state must have been a giant pool for a while. Here's the brewery. Doesn't look like a major source of conservative politics from here. 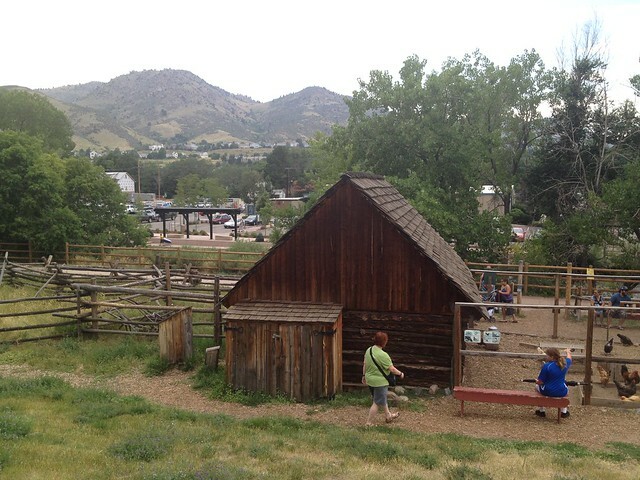 There's a little pioneer town along the river. Eryn fed the chickens. Our vacations seem to involve feeding animals. There's a little train that runs up and down the river (no tracks) and you have to be careful not to get run over. Golden seems to be something of an artist community slash resort town. So there's a lot of art along the river as well. 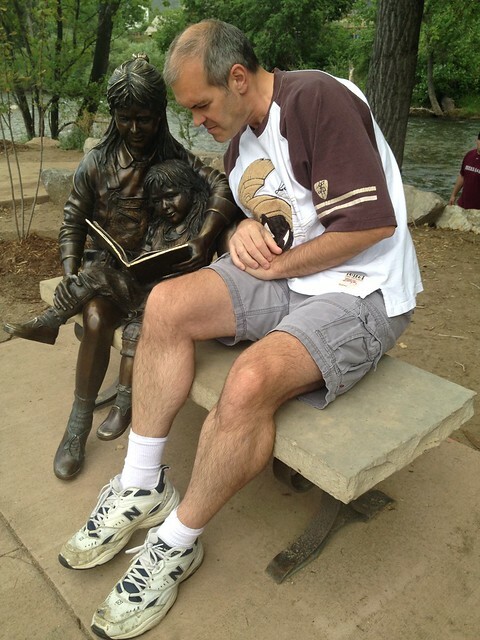 I took the opportunity to avail myself of posing with a few of the statue installations. I sang. And I read. 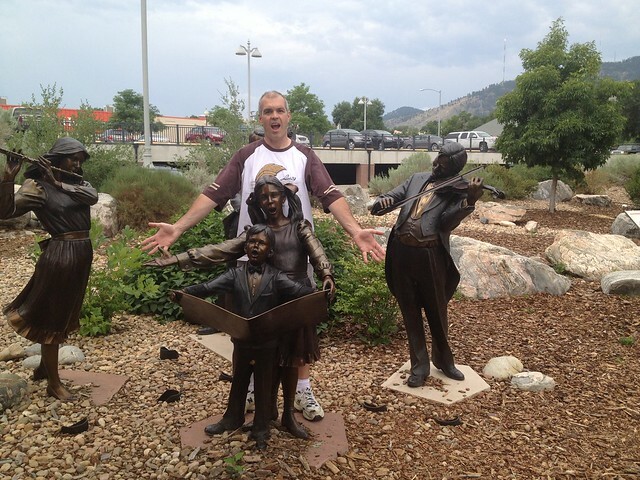 But I did not touch any of these statues inappropriately as I did the buffalo earlier. Some statues you just have to leave alone.